HARRISBURG - After four years, the Pennsylvania Gaming Control Board finally ran out of patience with the Foxwoods Casino project. In a decision that shocked Foxwoods' attorneys and left anti-casino activists giddy with victory, the commissioners voted, 6-1, Thursday to strip the project of its $50 million slots license. This is the first time the state has revoked a gaming license. If the matter winds up in court, it could mean that Philadelphia does not see a second casino for some time. The city's first gaming hall, SugarHouse Casino, opened in September in Fishtown. Pennsylvania's gaming law does not spell out the next step, said Doug Sherman, the board's chief counsel. An appeal, he said, would be handled by Commonwealth Court. The specter of litigation with Foxwoods could "freeze" that license, he added. "We have to wait and see." State Rep. Curt Schroder of Exton, the ranking Republican on the House Gaming Oversight Committee, said the license should be auctioned off across the state, not just to bidders in Philadelphia. He is preparing legislation to amend the gaming law to allow just that. "This is our one and only opportunity to do this in a way it should have been done in the first place," Schroder said. The gaming board rejected the Foxwoods group's latest attempt to salvage the project - this one involving partnering with Harrah's Entertainment Inc., of Las Vegas, to finance and operate a gaming hall in South Philadelphia. F. Warren Jacoby, a lawyer representing Foxwoods, said the board had acted "arbitrarily." He said he was "shocked" by the vote and did not know yet if the partners would appeal the board's decision. William Downey, an attorney for Harrah's, now doing business as Caesars Entertainment Corp., hurried from the hearing at the Pennsylvania State Museum without saying a word. According to sources, the Foxwoods group - Philadelphia Entertainment & Development Partners L.P. (PEDP) - already had sunk $182 million into the venture. That sum included a $30 million contribution from the Mashantucket Pequot tribe, which owns the Foxwoods megacasino in Connecticut, and a $60 million loan from Citizens Bank. In addition, the local investors bought the South Philadelphia property for $67 million, issuing an I.O.U. to a Harrah's affiliate that had owned the 16-acre waterfront site. In the last four years, the partnership also reportedly spent about $25 million on lawyers, advisers, architects, and other professional vendors. At least one group is interested in taking over for Foxwoods. Preservationists trying to save the SS United States - a historic but derelict ocean liner docked near what had been the proposed site - have pitched the idea of renovating it into a casino. Philanthropist H.G. "Gerry" Lenfest is backing the concept, in which the ghost ship would become the focal point of an ambitious redevelopment of the 16-acre waterfront property. For the city, Foxwoods' lost license means no extra tax revenue to pump up the budget. City Hall had anticipated $11 million in tax revenue a year from the casino, beginning in fiscal 2013. Mayor Nutter said Thursday that while the city budget would not be immediately affected, his finance director would have to revise revenue projections. "We are in a period here where there are obviously more questions than there are answers," Nutter said. The gaming board's decision marks a stunning collapse of a project that was viewed as a sure thing in 2006, when it won one of the city's two gaming licenses. The men behind it were some of Gov. Rendell's closest friends, including South Jersey entrepreneur Lewis Katz, Center City developer Ron Rubin, and Comcast-Spectacor L.P. chairman Ed Snider. They initially brought in the Mashantucket Pequot to join them in a bid to develop and operate a slots parlor on Columbus Boulevard, between Reed and Tasker Streets. But the tribe fell on hard economic times and could not move forward with the project. Local neighborhood and political opposition, particularly from Nutter, was fierce. The Foxwoods partners thought about moving the casino to a less expensive location in Center City. But the gaming board ordered them to ditch that idea and stick with the waterfront. They then approached Las Vegas casino mogul Steve Wynn about taking over for the tribe. But last April, after reaching an agreement, Wynn unexpectedly dropped out. Last Friday, Foxwoods and Caesars delivered to the gaming board a waist-high stack of documents that they said represented a "definitive agreement" to do a deal. The filings spelled out an agreement for a new partnership, changes to the ownership structure, and modifications to the design and financing arrangements. The Foxwoods partners needed to raise $75 million in equity to seed the project and borrow $200 million to construct the casino. Jacoby said they gave the board two letters from well-known financial institutions that were "highly confident" they would lend money to the venture. Jacoby said the group had a firm commitment for $46 million in equity: $25 million from Caesars and $21 million from Snider and a charitable family trust controlled by Katz's daughter, Melissa Silver. "We came prepared to have them say, 'We're very pleased,' " Jacoby said. However, the board's enforcement lawyers weren't buying it. They said key documents were incomplete or contained too many variables. The deal, as outlined, would not become final until at least next May, said Cyrus Pitre, chief enforcement counsel for the board. Under state gaming law, Foxwoods would have to open by December 2012, but only if it got an extension. Pitre said he did not consider the purchase agreement between PEDP and Caesars definitive. "They have their opinion; I have mine," Pitre said. During questioning of lawyers representing Foxwoods and Caesars, commissioners zeroed in on two main concerns: the changed charitable nature of the project, and differences in the vision for the casino in 2006 and today. The Foxwoods group won its license four years ago partly on the strength of the project's charitable mission. Snider and the family trusts for Rubin and Katz's daughter had pledged all of their profits - 42 percent of income - to local charities that serve underprivileged children. At the time, they testified that the contribution would amount to $300 million over 10 years. Under the new deal, the casino would give 2 percent of revenue to charities, Jacoby said. He also said that at least $500,000 a year for the next seven years would go to a Connecticut museum run by the Mashantucket Pequot. "The only solid commitment is $3.5 million going to the Pequot museum in Connecticut?" asked Commissioner Kenneth I. Trujillo, a former Philadelphia city solicitor. Board Chairman Gregory C. Fajt noted that the original Foxwoods plan outlined a $525 million project with 90,000 square feet of gaming space for 3,000 slots, an entertainment showroom, a 600-seat buffet, and a garage for 4,200 cars. But the newly proposed Harrah's Horseshoe would have had 64,000 square feet of gaming space for 1,500 slots, 1,372 parking spots, no showroom, and less dining. James B. Ginty, the only commissioner to vote for Foxwoods to keep its license, said the decision could put at risk 1,600 jobs and tax revenue for the city. "At best, this will delay those jobs and revenue for five years," said Ginty, a Rendell appointee and former head of AT&T Pennsylvania. Anti-casino activist Dan Hajdo was so blindsided by the revocation decision that he was momentarily speechless after the vote. His colleague with Casino-Free Philadelphia, Lily Cavanagh, was beaming. "We've been fighting this for four years," she said. "I know it's the right decision. . . . Predatory gambling doesn't belong in neighborhoods." State Rep. Michael O'Brien, a Democrat whose district butted up against the Foxwoods site, said he was "delighted this is 'game over.' "
"After four years of propping up the Foxwoods house of cards with half-truths and misrepresentations, it has finally fallen," O'Brien said. City Councilman Frank DiCicco pledged nearly four years ago to slow down the Foxwoods project as much as possible because he objected to its proximity to homes in his district. With rumors circulating in the past week about what action the gaming board might take, DiCicco said, "I was on the edge of my seat." Then he got the e-mail, during Council's Thursday meeting, about the license being revoked. His take: "There is a Santa Claus." July 4, 2004 The Pennsylvania General Assembly passes legislation allowing the opening of 14 slots parlors, including two in Philadelphia. December 2005 Local investors led by developer Ron Rubin, New Jersey entrepreneur Lewis Katz, and Comcast-Spectacor chairman Ed Snider team up with the Mashantucket Pequot tribe, operator of the Foxwoods Casino in Connecticut, to bid for a license in Philadelphia. Dec. 20, 2006 Foxwoods investors win a license. Jan. 4, 2008 The Street administration, in its final week in office, approves Foxwoods' plan of development, clearing the way for zoning approval of the project on the Delaware River in South Philadelphia. Jan. 25, 2008 The Nutter administration changes course, as the mayor supports City Council in blocking a permit for Foxwoods. April 4, 2008 Mayor Nutter testifies before Council, calling the waterfront location "the wrong site for Philadelphia." July 16, 2008 Foxwoods files a petition with the Pennsylvania Supreme Court for a special master, contending the city is trying to erect "every roadblock imaginable to prevent Foxwoods from developing its property." Aug. 21, 2008 Stymied by the city's inaction, Foxwoods investors propose to Gov. Rendell and Nutter that the project be moved to Center City. Sept. 10, 2008 At a City Hall news conference, investors are joined by Rendell and Nutter in announcing a move to Center City. Chinatown activists rally to block the project. Oct. 14, 2008 The state Supreme Court appoints a special master to handle disputes between the city and Foxwoods. January 2009 The Mashantucket Pequot tribe faces financial difficulties stemming from the downturn in gaming revenue and mounting debt. 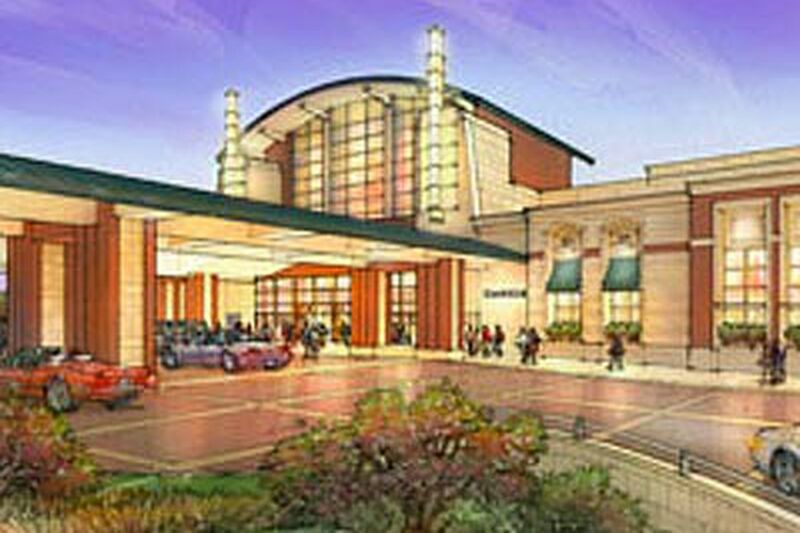 Feb. 25, 2009 Foxwoods selects the vacant Strawbridge's department store for a slots parlor after considering another part of the Gallery mall. March 13, 2009 Nutter holds a news conference pledging "unequivocal support" of two casino projects, including the SugarHouse Casino farther north on the Delaware. May 7, 2009 Another owner of the Strawbridge's building, Gramercy Capital, objects to the plan for a casino during Council hearings on zoning. May 22, 2009 Foxwoods asks the Pennsylvania Gaming Control Board for an extension of the license deadline for having 1,500 slot machines in operation. Aug. 28, 2009 The gaming board orders Foxwoods to return to its site on the Delaware River in South Philadelphia. The board establishes new deadlines for the project. Oct. 4, 2009 The state House begins debate on a new gaming bill to add table games. Oct. 16, 2009 Foxwoods warns the state gaming board that under its deadlines, it may have to build a temporary casino first. Nov. 14, 2009 The House releases a draft amendment to the gaming bill that would permit Foxwoods to get up to 12 more months to meet the terms of its license. Dec. 1, 2009 Foxwoods fails to submit design plans to state regulators. Jan. 7, 2010 Rendell signs a gaming law that includes language effectively giving Foxwoods until December 2012 to open. Jan. 27, 2010 Regulators fine Foxwoods $2,000 a day and threaten to revoke its license if it doesn't submit specifics on the casino's design and financing. March 1, 2010 Wynn Resorts confirms it has an agreement to take control of Foxwoods project. March 3, 2010 Steve Wynn appears before the state gaming board to promote his idea for a new casino. Regulators reset deadlines, but continue fines on the project, citing the need for details. April 5, 2010 Wynn meets with Nutter to describe his plans and submits artist renderings to the Gaming Control Board. April 8, 2010 Wynn Resorts announces that it is pulling out of all "agreements and negotiations" regarding the Foxwoods Casino. Mid-July, 2010 Harrah's Entertainment, the country's largest gaming company, surfaces as a potential replacement for Wynn. Oct. 27, 2010 For the second time in six months, Foxwoods investors present the gaming board with a new partner, Harrah's, and a plan to revive the stalled project. Nov. 18, 2010 State regulars give the Foxwoods group until Dec. 10 to submit evidence that its deal to turn over control of the project to Harrah's is signed and sealed. Dec. 16, 2010 In a 6-1 vote, the gaming board revokes the Foxwoods slots license.